Typing The Wilfred Brimley Fighting Diabeetuses is a fun experience. I do not know where people come up with these names. However, little of that creativity was used during the draft here. What’s seen here is a bastardization of the classic stars and scrubs spread of allocations with some curious choices sprinkled in. I mean, how in the hell is Addison Russell your highest paid hitter? Sure, he’s young, sure he could be great. But, I’m not expecting him to finish top ten at either shortstop or second base, and nor is any FanGraphs/Fantrax projection. I think it’s just okay at catcher with Yan Gomes, first with Ryan Zimmerman, Kolten Wong at second, they’re slightly better than scrubs. I like Stephen Piscotty and Khris Davis, and Kevin Kiermaier is okay. I can see the crazy logic going on here, the bench is deep and long, but was the blood sugar too low here and during the Addi auction? Reaching. If you could just mash this team with TBD you would have a super super team! Jake Arrieta is awesome. Jose Fernandez is awesome. Madison Bumgarner is awesome. Just a fantastic top three. Carlos Martinez is a 2 in the 4th spot. Nate Karns and Alex Cobb as your 5 and 6 is just gravy. Vincent Velasquez, Tanner Roark and Roenis Elias could all surprise or be nothing and not affect the outcome here much. The bullpen is sneaky good too. Dellin Betances was the best reliever last year without the closer role, should do well. Well, the bench exists, but when you’re already questioning the starters ability to be a starter, there’s issues. There’s good coverage for each roster spot. The players like Jedd Gyorko, Rusney Castillo, Jackie Bradley Jr, Matt Adams and Chase Headley are all capable of being surprisingly average. Hard to knock with those guys. Plus I like Kelvin Herrera as a bullpen stash at the end of the draft. If Arrieta, Jose and Bummy don’t crack 2,500 fantasy points, this season is over. Hard and fast. I think the floor here with many of the hitters is too low and the ceilings are just not high enough. 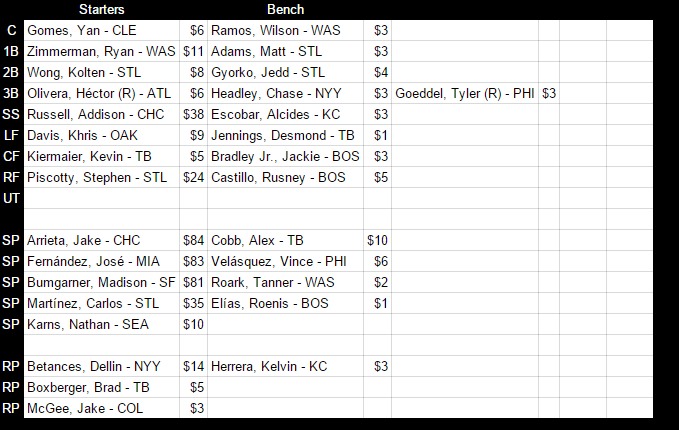 Odds are good the highest paid hitter is a easy non-tender candidate at the end of the season. Just where do you go with those hitters? I have seen some things. Amazing pitching can carry you week in and week out, even if they don’t start twice. If there’s 3,300 points between those three starters, it does not really take much to make up the rest from the rest of the roster. Consistency could be made up for by clever roster management. The plan is here and it is in place. One of the most fun watches this year especially if the three starters work out well, will be the roller coaster of a season this team is running.